What every business struggles with is sales and marketing. You’ve developed the perfect superior mousetrap, and are wanting to promote it to the world. It remains dormant however, collecting dust, this because you have no idea how to promote it to the masses. Regardless of the size of your company, what you need is to hire results orientated salespeople, who can pole vault your company into orbit like you’ve never imagined. You know that it’s possible, but the issue becomes finding these superstar salespeople. It doesn’t matter who you are, you’re most likely using the wrong criterion when you hire sales staff. What you need, want, is to attract and hire the star talent to your organization who can transform you. So you need to know what their strengths are first, this before you hire them. This instead of hiring someone who claims they can sell, only to find out later that they’re a ghost, a lightweight. You yourself can’t sell hoot, since you don’t have the aptitude to influence anyone to buy, this to grow your business. You’re a floundering one man band, so you need to hire competent salespeople, this to become sold out. Big or small, every business needs to understand the unique psychological traits, the distinct profiles which all top producing salespeople possess. These traits are vital, and more important than what their background, experience, or education is. The type of individual that you need is someone who can be airdropped into any bad situation with no training, no tools, bad resources, and without fail they begin to outsell your best salespeople. There are two distinct aptitudes that a superstar salesperson has. Both of these qualities are needed as they work in concert with each other. The first is they need to have empathy towards others. The other, they need high self-esteem of self. The top producers are extremely likable as they can bond with anyone, as they find something in common with every person they meet, and will then exploit it. What they’ll do is work on the prospect every which way they can, persistently attempting to find ways to serve them, please them, close them. So during the interview process, what you need is to find ways to expose their empathetic nature, and make sure they have it in spades. 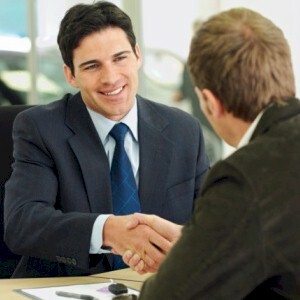 The other trait of a great salesperson is high self-esteem. It’s those with confidence, who barrels themselves into a prospects face, this after they’ve been told “no” numerous times. Those with poor self-esteem will quit after the first rejection. It’s the fear of failure, thinking that it’s them and not the prospect not being sold on the product yet, is why they reject. It’s known that 50% percent of all salespeople will give up after the first rejection. 4% percent will persist more than 4 times. To get a sale, on average, what it takes is up to 8.4 rejections. This is the difference between someone who faces rejection just once and quits, or is told “no” ten times but doesn’t stop. It comes down to self-esteem. Additional attributes of a strong salesperson is ambition and work ethic. Those who innovates, creates, expands upon and improves everything that’s assigned to them, wins. They’re overly eager to please during the job interview. So don’t allow a bit of bravado turn you off, as that’s the quintessential trait of a superstar salesperson. During the interview, the person is the product, so they need to present themselves with brashness, assuring you that they’re the one you want to hire. This aggressive behavior might scare some employers away, but that’s what you want in a salesperson. Age or gender isn’t relevant. A young buck fresh out of college can outsell 20-year veterans. You can find these outstanding salespeople out in the woodwork. Just learn to recognize the key traits. Approach them, offer them a job, hire them. They’re usually out in the world where you get your coffee from, someone who sells you a suit in a clothing store. They stand out, they glow, they’re diamonds in the rough, and they don’t realize their potential. You know who you are. Don’t bother calling unless you can overachieve and can prove it. The ad doesn’t request a resume. The first step is screening the calls over the phone. To flush out the top producers, tell them you’ll initially interview them over the phone for ten minutes, this to determine if you want to interview them in person. When screening the calls, apologize for you being gruff, blunt, and to the point, explaining that you’re overwhelmed with the massive response. Then ask them, “Tell me why you’re a superstar salesperson.” Then deliberately act unimpressed, bored, and slightly abrasive. If you intimidate them over the phone, then immediately brush them off. A top producing salesperson shouldn’t be intimidated. If they’re not able to talk their way into an interview, then what makes you think they’ll ever talk their way into closing a sale. Save yourself the headache, this by ridding those with poor self-esteem right off the bat. If you’re too nice during the interview process, then they’ll be nice as well. Then once you hire them, you don’t want to find out months later they can’t sell squat. So what you want is to find out immediately how well they can handle the rejection that you give them. What doing so will save you immense time, money, and grief.